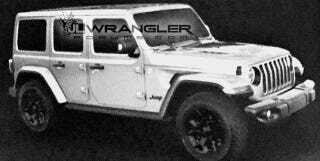 Jeep hasn’t officially confirmed what the 2018 Jeep Wrangler looks like yet, but these photos from Jeep Wrangler forum JL Wrangler Forums sure seem to show the four-door off-roader. The forum cites unnamed sources that confirmed that the 2018 JL Wrangler Unlimited will have features that include a solid frame, fixed roll cage, fully removable roof and doors, new larger front bumper design, taller windows and a slightly larger trunk. We have reached out to FCA for comment and will update if we hear back. For comparison, here’s the current Wrangler.